South Sudan's historic independence was celebrated around the world--a triumph for global justice and an end to one of the world's most devastating wars. But the party would not last long; South Sudan's freedom fighters soon plunged their new nation into chaos, shattering the promise of liberation and exposing the hubris of their foreign backers. Chronicling extraordinary stories of hope, identity, and survival, A Rope from the Sky journeys inside an epic tale of paradise won and then lost. This character-driven narrative follows a cast of liberators who rally around a common idea and achieve the unthinkable. Mobilizing on their behalf is an unprecedented coalition of Americas: Democrats and Republicans, ideologues and activists, evangelical Christians, and Hollywood celebrities. This righteous alliance helps deliver South Sudan from tyranny, only to watch in disbelief as it comes dramatically undone. Finally, a war-weary people must pick up the piece and start over again--an uncertain quest to salvage a republic from the shards of a broken dream. Weaving together narratives local and global, this is first a story of power, promise, greed, compassion, violence, and redemption from the world's most neglected patch of territory. But is also a story about the best and worst of America--both its big hearted ideals and its difficult reckoning with the limits of American power amid a changing global landscape. 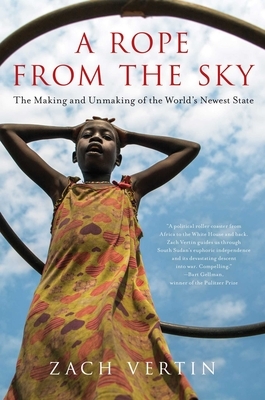 Zach Vertin's firsthand accounts, from deadly war zones to the halls of Washington power, bring readers inside this unique episode in global history--an unprecedented experiment in state-building, and a cautionary tale. From battlefields and ballrooms to the emerald green marshes of the Nile, A Rope from the Sky is brilliant and breathtaking, a modern-day Greek tragedy that will challenge our perspectives on global politics.